24007 Mariposa Place, Valencia, CA, 91354 as of 02/20/2014 listed in Valencia CA. 4 + 2 with 1858 sqft. 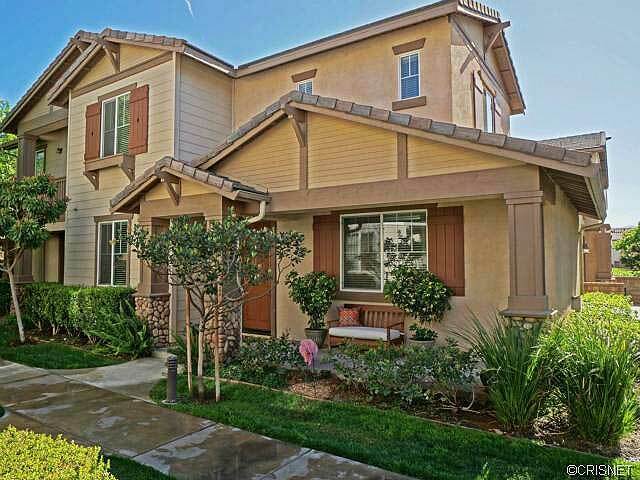 Wonderful Andorra home for sale in the sought after neighborhood of Valencia Creekside area. Absolutely Stunning 4Bd 3Ba Creekside Home. This home shows like a model! You will feel right at home in the oversized living room with its built-in gas fireplace and custom mantel. The kitchen has granite counters, stainless steel appliances, center island with seating and there is a separate dining area. There is a large patio perfect for entertaining, or for kids to play, with a feature wall. There is a downstairs bedroom with a full downstairs bathroom. The Master suite is relaxing with a sitting area, and a master bath with granite counters and a large spa tub. There are two additional bedrooms and another bathroom upstairs. This home boasts custom paint, laminate floors and upgraded carpet. The home is located in the very popular Creekside Community, it has two pools, a kids pool, Jacuzzis, clubhouse, BBQ and picnic areas, it is close to paseo trails, a large park, shops and restaurants. This home at 24007 Mariposa Place, Valencia, CA, 91354 is located off McBean Parkway. Interested in finding out what your home is worth? I would be glad to send an estimate via email.